Les personnes [canadiennes] qui assistent aux services religieux chaque semaine sont également beaucoup plus susceptibles que les autres de faire du bénévolat (66 % et 43 %, respectivement). C’est au Québec que ce taux est le plus faible (37 %). De même, les bénévoles caractérisés par une pratique religieuse hebdomadaire tendent à consacrer un plus grand nombre d’heures au bénévolat (232 heures comparativement à 142 heures). 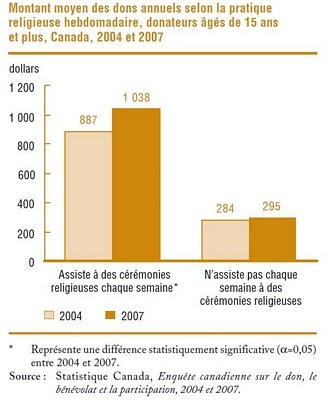 Les personnes caractérisées par une pratique religieuse hebdomadaire représentent 17 % des Canadiens, mais sont à l’origine de 35 % de toutes les heures de bénévolat en 2007. Elles fournissent 85 % de toutes les heures de bénévolat consacrées à des organismes religieux et 23 % des heures consacrées à des organismes non religieux. Charitable giving is about values, and the root, largely, is faith. More than nine in 10 religious people give money every year versus 66 percent of people who are secular; 67 percent of religious people give their time by volunteering versus 44 percent of the secular community; and religious people give about four times as much money away. It is a survey of 30,000 Americans across 41 communities in the year 2000. It is an amazing data source for all questions about service and civic life, including charity. Two of the communities in these data are South Dakota and San Francisco. […] Both cities give approximately $1,300 per year to charity per family. The fact is, they don’t give in a very similar way, and the reason is because their income levels are dramatically different. It turns out that when you look at San Francisco and South Dakota and you compare the sacrifice that these two communities make, any similarity dissolves. South Dakota, in terms of the sacrifice in real income, gives 75 percent more per family per year to charity than average families in San Francisco. Even if you look at disposable income, which gets rid of taxes and rents and costs of living, it is still 50 percent more. These communities couldn’t be more different. So what does religion really look like in these two communities, and how does it matter? San Francisco is on the left, where 49 per­cent are completely secular, which is to say they never attend a house of worship or say explicitly they have no religion, and 14 percent attend almost every week. In South Dakota, 10 percent say they are secular, and 50 percent are religious. Those kinds of patterns are robust across all kinds of behaviors. We have to measure these things right. It is all about how you behave-not who you affiliate with-so let’s look at that. It turns out that people who are between every week and never in their [house of worship] atten­dance behave in the middle in terms of charity. No surprises there. 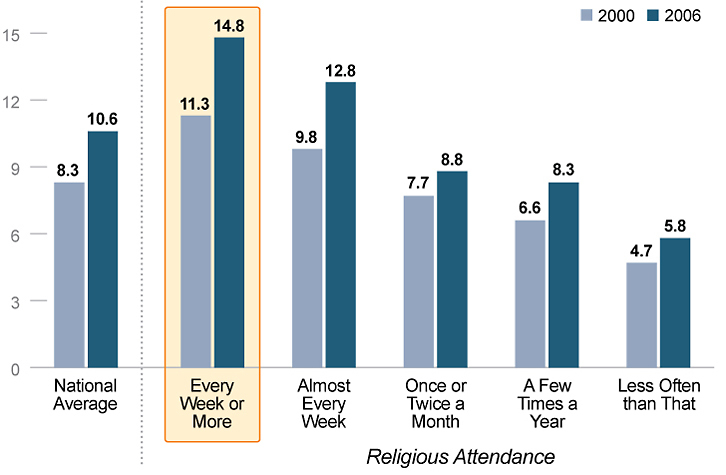 About a third of Americans attend their house of worship every week or more, and about 25 percent either never attend or say they have no religion. It is interesting to note that the 33 percent who are religious and the 25 percent who are secular have exactly the same average actual income: about $49,000 per household in the year 2000. There is no meaningful difference, so this is not the explanation. Religious people are twice as likely to donate blood as secular people. People who are religious are more likely to give a sandwich or a quarter to a homeless person; they are more likely to give up their place in line; they are more likely to give back mistaken change given to them by a cashier. That’s amazing, isn’t it? You find that religious people are 10 percentage points more like­ly than secular people to give to explicitly secular charities like the United Way. 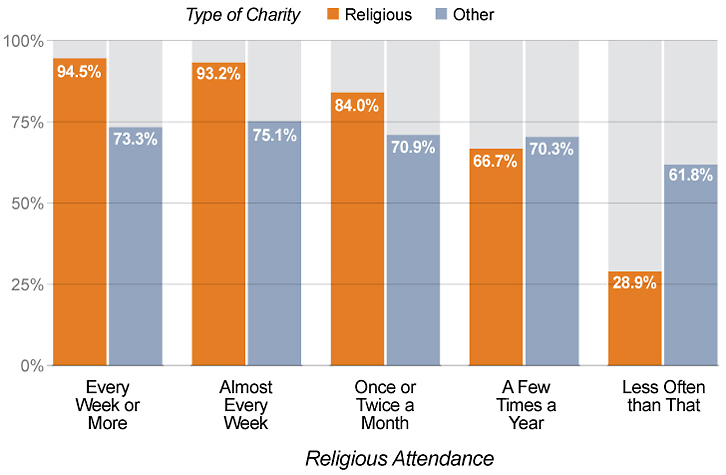 They are 21 percent­age points more likely to volunteer for explicitly secular charities like the PTA. The bottom line is that if it were not for religious people in your com­munity, your PTA would shut down. That’s what that amounts to. The percentage of secularist adults who donate to charity was 47 percent if they went to church every week as kids, and it was 26 percent if they didn’t go as kids. Con­servative families in America give about 30 percent more money to charity each year than liberal fami­lies while earning about 6 percent less income. They give more across every income bracket. The fact is, as a recent study shows, religious conservatives were the most likely group to gave money and volunteer — even to non-religious organizations and charities. They give about $1000 more annually per household and volunteer 10% more than the national rate. Secular liberals, like Maher, were the lowest givers of all groups. Let’s look at an interesting number that directly applies to Maher’s argument. According to the study, people who say that “beliefs don’t matter as long as you’re a good person” are 17 percent less likely to give to charity and 19 percent less likely to volunteer than people who say beliefs matter. Merci, merci beaucoup ! Voilà des études qui vont resservir. Un fait certain est que la France déchristianisée a malheureusement donné un très mauvais exemple. Le plaisir est mien !